Ingram agreed in principle Wednesday with the Ravens on a three-year, $15 million contract, Adam Schefter of ESPN reports. The Ravens have emerged as the favorites to sign Ingram, Ian Rapoport of NFL Network reports. Analysis: Ingram initially was optimistic about re-signing with New Orleans, but it became obvious negotiations didn't work out after the team reached an agreement Tuesday to sign Latavius Murray. 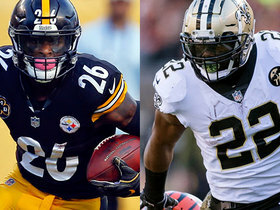 The 29-year-old Ingram can focus on finding his next team, with Baltimore apparently leading the way even as some rumors connect the Ravens to Le'Veon Bell. Ingram has already had discussions about re-signing with the Saints, Mark Inabinett of AL.com reports. "I've been talking to the Saints," Ingram said. "It's kind of like a thing where they say they want me back, I say, 'I want to be back,' it's just can we compromise on the value?" Ingram rushed nine times for 31 yards and brought in both of his targets for six yards during the Saints' 26-23 overtime loss to the Rams in Sunday's NFC Championship Game. Ingram rushed nine times for 53 yards and brought in both of his targets for nine yards in the Saints' 20-14 divisional-round playoff win over the Eagles on Sunday. Analysis: Ingram accomplished the majority of his ground production on a 36-yard scamper early in the fourth quarter. He otherwise found running room to be at a premium, as the Eagles' front won the war at the line of scrimmage for a substantial portion of the contest. While his final line was a modest one, Ingram will nevertheless be an integral part of the game plan once again in next Sunday's big showdown versus the Rams. Ingram rushed for 28 yards on five carries and added 15 yards on two catches during Sunday's 33-14 loss to Carolina. Ingram is active for Sunday's game against the Panthers but may handle a lighter workload than normal, John DeShazier of the Saints' official site reports. Ingram carried the ball 11 times for 35 yards and a touchdown in Sunday's 31-28 win over the Steelers. He also added one reception for eight yards. Ingram rushed 12 times for 63 yards and caught both his targets for 11 yards in Monday night's 12-9 win over the Panthers. Analysis: Ingram's rushing total marked his most since he topped 100 yards in Weeks 10 and 11. The veteran's tally was boosted by a team-long run of 22 yards, and although Alvin Kamara finished with 67 yards and a touchdown on his 14 carries, Ingram was again rather efficient working in tandem. The bruiser will now prepare himself for Week 16's matchup with the Steelers. Ingram rushed 13 times for 52 yards and a touchdown and brought in one of three targets for three yards in the Saints' 28-14 win over the Buccaneers on Sunday. Ingram rushed seven times for 27 yards and brought in two of three targets for one yard in the Saints' 13-10 loss to the Cowboys on Thursday. Analysis: Ingram's opportunities were notably limited, as he logged a season-low amount of carries. The eight-year veteran appeared to be surging with back-to-back 100-yard efforts in Weeks 10 and 11, but he's now netted 79 yards on 18 rushes over his last pair of contests. Ingram will look to bounce back to his prior level of production against the Buccaneers in a Week 14 divisional clash on Dec. 9. Ingram put up 52 rushing yards on 11 attempts, adding two receptions for 14 yards during Thursday's 31-17 win against the Falcons. Ingram rushed 16 times for 103 yards and two touchdowns in Sunday's 48-7 victory over the Eagles. Ingram rushed for 104 yards on 13 carries and added 58 yards and a touchdown on three catches during Sunday's 51-14 win over the Bengals. Ingram ran for 33 yards on nine carries and added a 3-yard catch during Sunday's 45-35 win over the Rams. He lost a fumble during the contest. Analysis: While stablemate Alvin Kamara scorched the Rams for three touchdowns, Ingram set season lows in touches and yards and has not scored in his last three games. 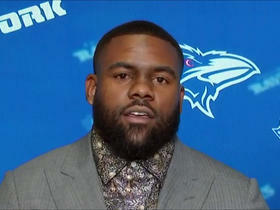 Still, he looks like a solid bet to continue to record double-digit touches per game and avoid the doghouse. Ingram's second-quarter fumble didn't hurt him too much as he recorded six carries after that point. He gets a great matchup Sunday against a Bengals defense ranked 30th in the league at 4.9 yards per opponent carry. Ingram gained 63 yards on 13 carries and added 29 yards on three receptions in Sunday's 30-20 win over Minnesota. Ingram ran for 32 yards on 12 carries and added 10 yards on two catches during Sunday's 24-23 win over Baltimore. The Saints are hoping to keep the backfield touches between Ingram and Alvin Kamara more balanced in future weeks, Nick Underhill of The New Orleans Advocate reports. Ingram rushed 16 times for 53 yards and two touchdowns in Monday night's 43-19 win over the Redskins. He also caught two of three passes for 20 yards. Analysis: Ingram marked his return from suspension by scoring a two-yard touchdown on his first drive back. He later doubled his touchdown tally by plunging in from the one-yard line during the second quarter, showing power around the goal line. On the night, his 18 touches comfortably surpassed Alvin Kamara's nine, but considering New Orleans led comfortably for the better part of the contest, it's of no surprise the team leaned on the more fresh Ingram to grind out the clock. Ingram (suspension) returned to practice Thursday. Analysis: After completing his four-game suspension for a violation of the NFL's policy on performance-enhancing drugs, Ingram is taking the practice field for the first time during the 2018 regular season. The Saints are expected to incorporate Ingram into the game plan Monday against the Redskins, but it remains to be seen how much he'll cut into Alvin Kamara's touch count. Once the duo entered a timeshare Week 4 of last season, Ingram handled 19.2 touches per game to Kamara's 13.9. Ingram (suspension) rejoined the Saints following Sunday's victory over the Giants and is expected to be reinstated to the 53-man roster Monday, Josh Katzenstein of The New Orleans Times-Picayune reports. Ingram was placed on the reserve/suspended list Saturday, Josh Katzenstein of The New Orleans Times-Picayune reports. Ingram (suspension) has seen an uptick in preseason snaps compared to previous seasons to prepare him for his four-game ban from the team, Herbie Teope of NFL.com reports. Ingram (suspension) was seen participating in the Saints' mandatory minicamp Tuesday, Nick Underhill of The Baton Rouge Advocate reports. Analysis: As expected after not participating in OTAs, Ingram was back on the practice field for the start of minicamp despite having to serve a four-game suspension at the start of the regular season. Ingram is expected to cede the role of No. 1 running back to second-year star Alvin Kamara until he is reinstated by the league for Week 5. Ingram (suspension) will not participate in OTAs, but he is expected to join the club for mandatory minicamp in June, ESPN reports. Ingram's appeal of his four-game suspension for performance-enhancing drugs has already been heard and denied, Josh Katzenstein of The New Orleans Times-Picayune reports. Ingram will appeal the four-game suspension he received Monday for violating the NFL's performance-enhancing drugs policy, Ian Rapoport of NFL Network reports. Ingram has been suspended four games for violating the league's PED policy, Ian Rapoport of NFL Network reports. Ingram carried 10 times for 25 yards while catching his only target for three yards during Sunday's 29-24 NFC divisional-round loss to Minnesota. Ingram finished with nine rushes for 22 yards and caught his lone target for 13 yards in Sunday's 31-26 NFC wild-card win over the Panthers. Analysis: Ingram and partner-in-crime Alvin Kamara faced tough fronts throughout the day, but neither standout tailback could get anything going Sunday. In fact, Ingram's rushing output marked his lowest since Week 1. Coincidentally, that performance came against the Vikings, which Ingram will face next Sunday in the divisional round. Ingram gained 35 yards on 13 carries and 19 yards on four receptions in Sunday's loss to the Buccaneers. Ingram carried 13 times for 44 yards and a touchdown Sunday against the Falcons. He also caught all three targets for an additional 22 yards in the 23-13 win. Analysis: Ingram broke loose for a 26-yard touchdown in the third quarter, but he mustered just 18 yards on his other 12 carried combined. The touchdown was his 12th in the last 11 games, and he now has at least 62 scrimmage yards in all but one contest this season. Ingram's remarkable consistency has made him a premier fantasy option at running back and he should continue as such next week against the Buccaneers, as his team jostles for playoff positioning. Ingram ran for 74 yards and two touchdowns on 12 carries and added 77 yards on five catches during Sunday's 31-19 win over the Jets. Ingram (toe) rushed 12 times for 49 yards and brought in four of five target for 43 yards in Thursday's 20-17 loss to the Falcons. Ingram (toe) is listed as active Thursday at Atlanta, Josh Katzenstein of The New Orleans Times-Picayune reports. Ingram (toe) is expected to play Thursday night against the Falcons, Adam Schefter of ESPN reports. Analysis: Ingram was held out of practice both Tuesday and Wednesday, raising a real concern that he might not be able to play in the divisional matchup coming off a short week. Though the news seems positive, be sure to check back for the official inactives list at approximately 7 p.m. EST to confirm Ingram's status on the active roster. Whether or not Ingram is cleared to play, Alvin Kamara may be counted on to take on a heavier workload if Ingram is not quite at 100 percent. Ingram (toe) was listed as a non-participant at Wednesday's practice and is questionable for Thursday's game against the Falcons, Herbie Teope of The New Orleans Times-Picayune reports. Ingram (toe) was listed as a non-participant at practice Tuesday, Josh Katzenstein of The New Orleans Times-Picayune reports. Analysis: That said, Herbie Teope of The New Orleans Times-Picayune relays that Ingram was on the field with his teammates Tuesday and participated in the stretching and conditioning portion of the Saints' walk-through practice. Added clarity on Ingram's Week 14 status should arrive upon the release of the team's Wednesday injury report pertaining to Thursday night's game against the Falcons. Ingram (toe) was listed as limited on the Saints' estimated injury report Monday, Joel A. Erickson of The Baton Rouge Advocate reports. Analysis: Since sending Adrian Peterson to the Cardinals in advance of Week 6, the Saints have ridden Ingram and rookie Alvin Kamara to the No. 3 rushing offense. Ingram himself has accounted for 752 yards on the ground, 130 receiving yards on 27 catches and nine touchdowns in eight games during that stretch. Despite the toe concern, Ingram would have participated in some capacity Monday if practice was held, so his status for Thursday's game in Atlanta doesn't seem to be much of a concern. Ingram took 14 carries for 85 yards and a touchdown and caught six of seven targets for 37 yards in Sunday's 31-21 win over the Panthers. Analysis: Coming off his worst game of the season, Ingram got off to another slow start but didn't stay down for long. He ripped off a beautiful 72-yard run early in the second quarter, and then hit paydirt from three yards out just two plays later. Ingram otherwise was held in check, while Alvin Kamara turned 14 touches into 126 scrimmage and two touchdowns. Both backs figure to remain heavily involved and productive on Thursday Night Football in Atlanta in Week 14. Ingram carried 11 times for 31 yards while securing two of three targets for five yards during Sunday's 26-20 loss to the Rams. Ingram rushed 11 times for 134 yards and a touchdown while adding three catches for 21 yards on four targets in Sunday's 34-31 overtime win against the Redskins. Analysis: Ingram's 36-yard rushing touchdown tied the game 10-10 late in the first quarter, and he set up Will Lutz's game-winning, 28-yard field goal in overtime with consecutive runs of 20 and 31 yards. His limited workload was due to New Orleans playing from behind for most of the game, as the team overcame a 15-point deficit in the final three minutes of regulation. Fellow running back Alvin Kamara starred in that comeback, but Ingram remains the top option on the ground. Ingram carried 21 times for 131 yards and three touchdowns during Sunday's 47-10 win over the Bills. Ingram rushed 16 times for 77 yards and brought in his sole target for two yards in Sunday's 30-10 win over the Buccaneers. Analysis: Ingram paced the backfield in carries and rushing yardage, once again forming an ideal 1-2 punch with rookie Alvin Kamara. After losing a pair of fumbles last week, Ingram held onto the ball Sunday and has now logged 75 or more rushing yards in the four games since Adrian Peterson left town. Ingram did seen a three-game streak with at least one rushing touchdown come to an end, but he continues to be one of the most productive fantasy options at his position in any format. 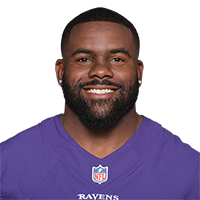 Baltimore Ravens running back Mark Ingram discusses his team's 2019 schedule and expectations. 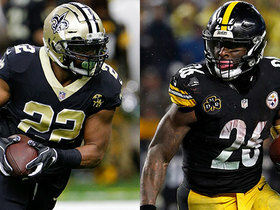 NFL Network's Michael Robinson predicts how running backs on new teams will fare in 2019. NFL Media's Senior Fantasy Analyst Michael Fabiano projects the fantasy impact of players with new teams. 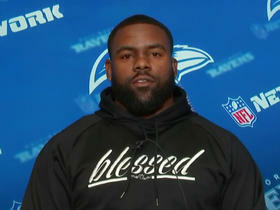 Baltimore Ravens running back Mark Ingram joins "Up to the Minute" to talk about his decision of signing with Baltimore and leaving New Orleans. 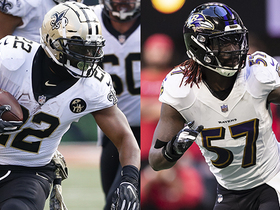 NFL Network's Willie McGinest and linebacker Brandon Marshall predict where some of the top free agents will sign this offseason. 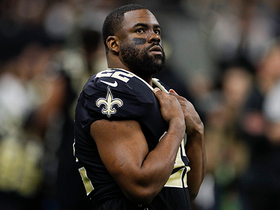 NFL Network's LaDainian Tomlinson and Terrell Davis reveal which teams they believe would be ideal landing spots for impending free agent running back Mark Ingram. 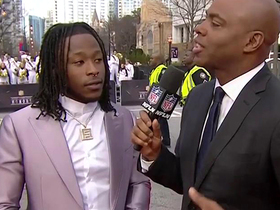 New Orleans Saints running back Alvin Kamara talks about the team's tough loss and running back Mark Ingram becoming a free agent. 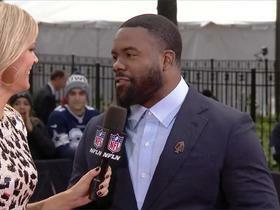 NFL Network's Melissa Stark catches up with new Orleans Saints running back Mark Ingram ahead of NFL Honors to talk about his team's 2018 season, his future and more. 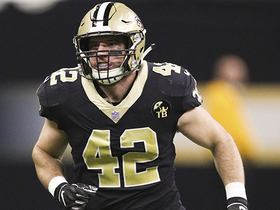 Watch the best key blocks from New Orleans Saints fullback Zach Line in his 2018 season. 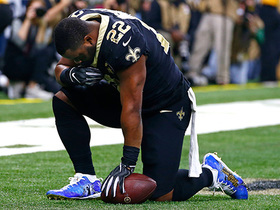 New Orleans Saints running back Mark Ingram punches in the first touchdown of the game on a 1-yard run.